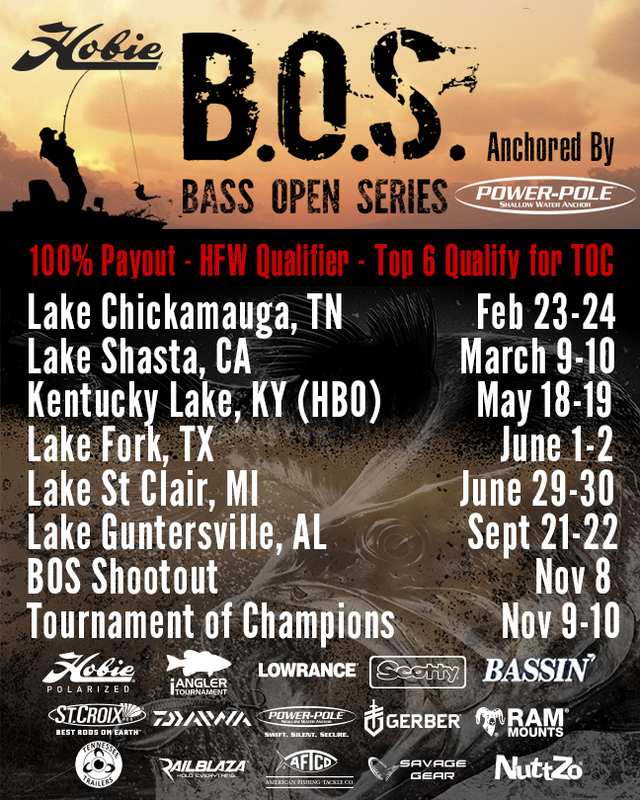 The Bass Open Series (BOS) Satellite events aim to provide more opportunity for anglers around the country to qualify for the Tournament of Champions (TOC). Each single-day event has been strategically placed to provide even more areas of the country an option to fish closer to their home but still be competing for a coveted spot in the elite 50 angler Championship that culminates our season. In a true Catch, Photo, Release format, anglers will try to submit their longest 5 black bass for a chance to earn a PAID Entry into the TOC. 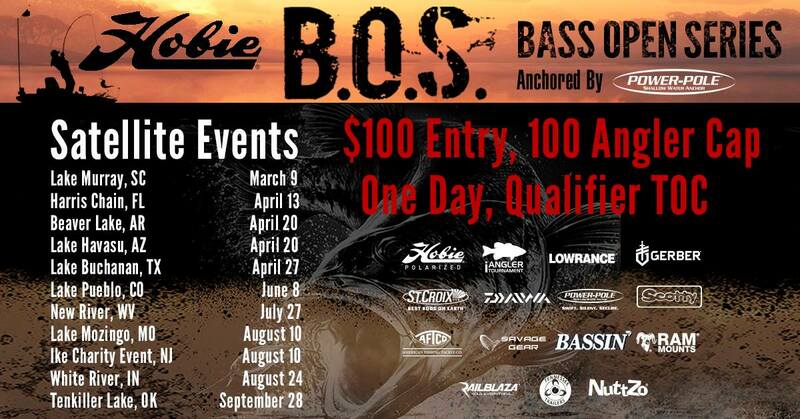 $100 Entry with a 100 Angler Cap, 1- Day event. $1000 flat rate from each Satellite goes to build the TOC Pot. Winner of each Satellite earns a PAID entry to the Tournament of Champions. Alternate spots for anglers declining their invitation will only be distributed within the Top 10. The paid entry will go to the angler that accepts their invitation. Satellites will payout 10% of the field with all remaining funds less $1000 for TOC, $200 for winners entry and Administrative/ PayPal Fees. A Catch, Photo, Release format will test an anglers skill on premier fisheries during prime conditions. Anglers will be able to turn in their longest 5 Black Bass. This event will coincide with the KATS Lake Buchanan event. Release and launch times will be the same as KATS to allow and encourage anglers to fish both events. Please read both rules and be aware of differences between the events. Hobie BOS rules DO apply to this tournament. To view the rules and/or liability disclaimer from your desktop, please select the blue "Rules & Regulations" and "Liability Disclaimer" bars at the bottom of this screen. To view the rules and/or liability disclaimer in the iAngler Tournament mobile app, please select the "Notebook" icon on the tournament homepage. Processing fee of $5.00 USD will be added to the registration fee. Last week, we released a major update to the iAngler Tournament mobile app. If you're new to the iAngler Tournament mobile app, or it's been a while since you've logged in, please take a moment to review this video. It takes you through the catch logging process and highlights the recent enhancements. All Federal, State, and Local laws, rules, markings, orders, and warnings must be followed and will supersede BOS rules at all times. Violation of any laws will be cause for disqualification. All violations of laws will be turned over to the proper authorities for investigation and possible prosecution. This includes, but is not limited to, cheating, harassment, wildlife violations, illegal drug use, and any other illegal activity. These rules will remain subject to change by BOS Officials. Special Rules and amendments may be announced, added, or omitted for special circumstances or clarification at the judgement of BOS Officials. Interpretation and enforcement of these rules will be left exclusively to BOS Officials. Decisions of BOS Officials/ tournament director(s) are final in all matters and are not subject to appeal. A violation of  tournament rules may result in penalties or disqualification at the discretion of BOS Officials. All participants must have paid the full entry, sign the liability release, and attend the mandatory captains meeting to be considered a contestant. Competitors must register and pay to be guaranteed entry in any BOS event. Anglers registering without paying will be placed on the waiting list. The number of places paid and amounts will be determined by event and number of entries. Payback will be for a minimum of 10% of paid entries, rounded down. BOS reserves the right to add money and prizes to paybacks. Any person under the age of 18 entering a tournament must also have permission and a signed release of a parent or legal guardian. Any person’s participation in any tournament is at the sole discretion of BOS officials. All contestants must have a valid fishing license for the waters they fish. Any Contestant who wishes to withdraw from the event is eligible for a 90% refund of their entry fee, provided notification of cancellation is made no later than 24 hours PRIOR to the official practice period. A 10% fee will be withheld from all cancellations. All cancellation requests MUST be made in writing via email or letter, and tournament officials must be notified immediately. Cancellations must be verified and accepted before a refund will be issued. If the event was full prior to a cancellation, the next in-line on the waiting list will get an opportunity to enter. BOS officials will go down the list until spots are filled or registration is cut-off. There will be NO designated off-limits period. Designated official practice period:  Official Practice Period will begin at 12:01 AM the Saturday prior to the event  and end at the start of the mandatory pre-tournament (Rules) meeting. Contestants may not enter tournament waters for any reason after the start of the pre-tournament meeting and in between weigh-in and launch of multi-day events except during official tournament hours. All practice during official practice and tournament must be done in a vessel in accordance to Section 8: KAYAK REGULATION. If boat is legally licensed, electric motors will be permitted for PRACTICE ONLY. All state rules for motorized kayaks apply. Failure to comply, could result in disqualification. Testing equipment on tournament waters after the start of the pre-tournament meeting is NOT permitted for any reason. he purchasing of, or bartering for, information about locating or catching fish on tournament waters, including, but not limited to, GPS waypoints (other than through commercially available sources) and the hiring of fishing guide services is not permitted during OFFICIAL PRACTICE period through the conclusion of the tournament. Hiring or using a guide for tournament waters within 21 days of the event is prohibited. During official tournament days, contestants may not solicit information about locating or catching fish on tournament waters from anyone except other anglers confirmed in the tournament and through publicly available sources. Quasi-public websites, blogs and/or social media pages set up for the specific purpose of sharing information with individuals or a small group of individuals are NOT publicly available sources. The purchasing of, or bartering for, fishing locations from another contestant is strictly prohibited and will be cause for both contestants to be disqualified from the entire tournament. This includes sharing information for the purpose of sharing or pooling winnings. It is mandatory that all contestants attend the pre-tournament (RULES) meeting. Each contestant must check-in prior to the pre-tournament (RULES) meeting in person at the designated site. Check-in hours and locations will be announced for each individual tournament. Safe boating must be observed at all times. Each contestant is REQUIRED to wear a fastened U.S. Coast Guard-approved personal flotation device while fishing from or maneuvering their kayak during tournament hours. Inflatable belt PFDs are not considered satisfactory in BOS events. At the discretion of the tournament director, tournament days may be shortened, postponed or canceled due to unsafe weather or water conditions. Competitors may leave their boat and seek shelter in bad weather or when danger is eminent. Violation of or failure to comply with event or state rules. Consumption and/or possession of alcoholic beverages or any kind of mind-altering substance during tournament hours. Suspension/disqualification, probation or ban from any tournament or fishing organization. Verbal or physical abuse towards fellow competitors and tournament directors on or off the water during the official practice period through the tournament weekend. Blocking navigable waters from fellow competitors to pass thru by, but not limited to, boat positioning and cast placement. Working with a non-competitor to block other anglers or hold spots before or during tournament hours. Any words, conduct or actions reflecting unfavorably upon efforts to promote safety, sportsmanship, fair competition and compliance with tournament rules, or which fail to comply with the standards set forth in the first sentence of paragraph 7. Smoking is not allowed in the weigh-in line during any BOS competition. Smoking must be done away from directors and large groups of anglers. Please be respectful of others. In case of any conduct not complying with the standards outlined above, BOS shall have the right to refuse an application to compete, to deny a confirmed application to compete by returning the entry fee (less 10%), and to disqualify a contestant or impose any penalty outlined in paragraph 1. All Kayaks/ SUPs/ vessels must be human powered, (paddle or pedals only). Motor or battery must be removed from vessel and completely out of water during tournament hours. Vessel must be 9’ minimum and shorter than 18’. Catamaran style personal fishing vessels complying with all other regulations will be eligible. No "Homemade" Kayaks will be permitted. The use of an accessory specifically to move the vessel outside of pedals or paddles will not be permitted. The use of manual or motorized anchor system is permitted. Mothershipping, tethering/holding or any transportation coordination with a non-competitor is strictly prohibited unless approved by BOS officials within emergency situations. By officially entering, contestants agree to submit their kayak to an inspection by BOS personnel. Fishing is defined as rod and reel in hand with attached line and lures. All bass must be caught alive in a conventional sporting manner by the angler out of their vessel. All lures must adhere to state regulations. Only artificial lures may be used, with the exception of pork trailers and biodegradable soft baits. Alabama rigs and similar umbrella-type rigs are considered to be one lure, and are only limited by the laws within the state they are fishing. Only ONE fishing rod may be used at a time. Each cast must be completed before another cast is allowed and there can never be more than one lure from one rod actively fishing in the water at any time. Trolling as a method of fishing is NOT allowed. Long-lining and drifting with current/wind are allowed. All bass caught while sight-fishing must be hooked inside the mouth. No fish are to be kept on stringers. Fish gripping devices are acceptable to temporarily hold fish in the water. If catching schooling fish, No more than 2 fish can be tethered to or in your kayak at any given time. Restrictions, designated launch points, official tournament waters, and other location mandates may be issued for individual events. Contestants may fish anywhere on tournament waters available to the public and accessible by kayak except areas posted or otherwise designated as “off-limits,” “no boats,” “keep out,” “restricted,” “no trespassing” or “no fishing” (or similar language or markings intended to restrict public access) by BOS, commercial property owners and/or local, state or federal officials. All fishing must be conducted from inside the kayak unless otherwise stated by tournament officials. At no time may a contestant leave the kayak to land a fish, photograph/submit a fish or to make the kayak more accessible to fishing waters. The cutting of trees, bushes and/or logs after the start of the pre-tournament meeting and/or the removal of official local, state or federal barricades at any time to make an area more accessible by kayak is strictly prohibited and may result in disqualification from the tournament. Boats may never be tethered to on water markers like buoys or safety signs. The use of cables, ropes, chains or any type of block and tackle system to maneuver a kayak into fishing waters is strictly prohibited. Using any items including the kayak or fishing line to block an area off to other competitors or anglers is strictly prohibited. In the event of equipment failure or emergency, the tournament director(s) must be notified as soon as it is safe to do so. Always contact 911, emergency services, and contacting tournament personnel after reaching safety. Scoring is determined by length using 1/4 inch increments of each contestant’s catch during each tournament day via the Catch, Photograph, and Release (CPR) method. Each competitor will be provided with a unique identifier for the tournament. The five longest verified lengths will be totaled for the anglers score. The contestant with the highest total score after two days is the winner. Rounding will be down and to the nearest ¼ inch. Only the Black Bass Species consisting of the following: Largemouth, Spotted, Guadalupe, Shoal and Smallmouth bass and any hybrid of the above are accepted species. Best 5 (five) fish make up a daily limit. All fish must measure a minimum of 12”, unless otherwise specified for individual events. Bass submitted that fail to measure 12” with mouth completely closed will not be scored. A submitted fish will only count once to an angler’s aggregate score for all days of the tournament. The Hawg Trough and Ketch Board are the official, mandatory, measuring devices for the Hobie Bass Open Series events and it subsidiaries. Contestants must bring their own measuring device. Your measuring device may be inspected by BOS staff at any time before, during, or after the tournament. Anyone found to be using a measuring device that is determined to be not legal will be disqualified from the tournament. Ensure the markings on your measuring device are clearly marked and can be seen by the scoring official. Consider marking the lines on your Hawg Trough with a black marker. However, excessive marking may result in a penalty. Anglers must be prepared to manually upload pictures with cables, cords, software, etc required to download photos via a USB port to the official judge’s computer. The entire Bass, from the tip of the lip to the end of the tail, on an approved measuring device, while in a tournament legal vessel. Laying with the tip of the lip against the post end of the measuring device. The mouth of the Bass must be CLOSED COMPLETELY. The tail of the Bass must be laying flat on the board, and will be measured to the longest point. Pinching the tail is permitted. Bass must be facing to the left, tail to the right, belly toward the angler. Measuring device markings must be clearly visible. Including the actual numbers. Assigned unique identifier must be visible. One overhead photo shot frame (not shot at an angle). Fish must be clear of any holding devices including fishing lure or hook. Lip, eye, and tail cannot be obstructed in the photo, even by your hand or identifier. Hand or fingers must not be under the gill plate. If fish has a visible glossy eye or odd markings it is suggested the angler take video of that fish going from the board, and actively swimming away. Any questionable issues with a fish should be immediately brought to the BOS official’s attention. Quality of the photo submitted is the responsibility of the angler. The largest one-day catch for the tournament will break ties. If a tie remains, it will be broken first by total number of fish legally submitted, then by longest fish, followed by next longest fish until all fish have been accounted. If a tie still exists, the tournament director(s) will divide cash, prizes, and points among the anglers involved in the tie. Big Bass ties will be broken by next legal largest fish over all days of the tournament, and so on, until the tie has been resolved. In the event that a ties still exists, the winner will be determined by earliest photo submitted of their largest fish. Each contestant agrees to submit, by registering for this tournament, to a polygraph or voice stress analysis examination and to abide by its conclusion. Consumption of alcohol or any mind altering substance is strictly prohibited prior to a truth verification test. Refusal to participate in the polygraph or voice stress analysis examination will result in disqualification from the tournament. Failure to pass an examination, if administered,  will result in disqualification from the tournament. Truth verification tests will be used at BOS Official’s sole discretion, and the determination of the meaning of the results will be made solely by BOS. All protests must be submitted in writing to BOS officials, along with a $100 cash deposit, within thirty (30) minutes of check-in to the tournament director(s) or designated tournament official. The protester also agrees that if there is a question of verifying the charge of a protest that he or she also may be subject to take a polygraph and agree to testify in a court of law if necessary. If the Tournament Director, or polygraph, upholds the protest, the cash deposit shall be returned to the contestant submitting the protest. I know that the responsibility for a person to participate in the Hobie Bass Open is his or hers alone. I know there is risk of injury and equipment damage while preparing for and participating in the event, and while upon the event premises, relying on my own judgement and ability, I assume all such risks of loss and hereby agree to reimburse all costs to those persons or organizations connected with this event for damages or injury to property or person incurred as a result of my negligence. I agree to comply with the written or oral terms and conditions of participation and any other rules that govern this event. I give Hobie Cat Company and parties designated by Hobie Cat Company, including clients, licensees and purchasers, the right to use my name and any photograph and video of me for sale to any medium for purposes of advertising, trade, display, exhibition, social media, television or editorial use. I, for myself and on behalf of my heirs, personal representatives and next of kin, hereby release, indemnify and hold harmless Hobie Cat Company, its officers, officials, agents, employees, sponsors and advertisers, and if applicable, the owner and lessor of premises used to conduct the event should any material damage or personal injury or death sustained in conjunction with or prior to, during, or after the event occur. If I am under the age of 18 years old and I qualify and accept the invitation to participate in the Hobie Fishing Worlds, then I must be accompanied by a legal guardian. I am responsible for my legal guardian’s expenses for the event in its entirety, including travel and event functions. I am aware that this can include overseas travel based on the location of the event. I HAVE READ THIS RELEASE OF LIABILITY AND ASSUMPTION OF RISK AGREEMENT AND THE RULES GOVERNING THESE EVENTS. I FULLY UNDERSTAND THE TERMS, UNDERSTAND THAT I HAVE GIVEN UP SUBSTANTIAL RIGHTS BY SIGNING THIS RELEASE AND THAT I SIGN IT FREELY AND VOLUNTARILY WITHOUT INDUCEMENT.